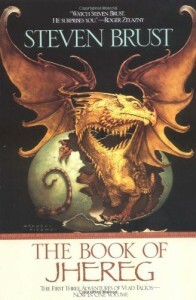 I was a little disappointed by this omnibus, which was my introduction the Taltos books. I'm not sure why Jhereg was printed first since it presumes prior knowledge of things that don't get elaborated on. Plus, I was a little annoyed that such a powerful, immortal race needed a lowly human to figure stuff out for them. Yendi was better and was a decent story. Teckla was stupid. Vlad and his wife give up their marriage because they won't talk to each other? Lame. Not to mention, lazy writing.